I didn’t invent the pin stitch. I believe it was invented by a talented American stitcher named Mayté. I learned it from on-line forums and Web sites years ago, but recently haven’t been able to find it. So it seemed a good idea to put together my own tutorial. 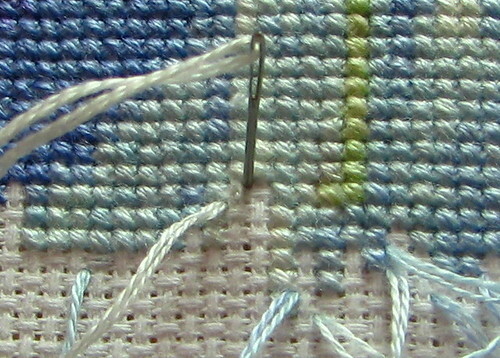 The pin stitch is a neat, unobtrusive way to begin and end the thread in counted embroidery. Its advantages are that it can be worked from the front of the fabric (a big advantage for those of us who do not own a frame that flips over easily), it uses very little floss, it is secure, does not cause noticeable thickening of the stitch or back, and it is invisible. I’ve worked these examples on 18-count aida, because that’s what my current project is worked on. This method works for 2×2 (cross-stitches over 2 threads) but it isn’t good for 1×1 cross-stitching because it tends to make the stitch too thick. I’ve used this stitch to secure the thread under satin stitch, chain stitch, and other stitches. It works well as long as the threads on top cover the area where the pin stitch is worked. All photos are on my Flickr account. If you need to see a larger version, click the photo to go to the Flickr photo page. Click “All Sizes” to see the original size photo. All photos were taken with a Canon PowerShot S5, because it has such a great macro function. 2. Pull the needle until only a 1/4 inch (.5 cm) tail remains on the right side of the fabric. 3. 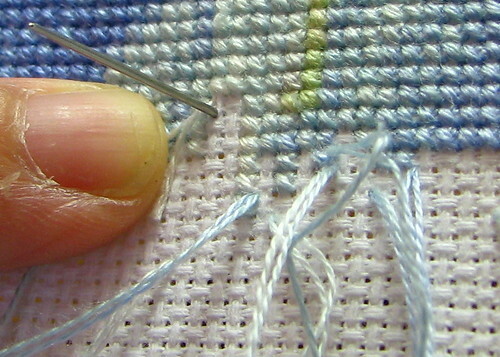 While holding the thread tail with your fingernail, bring the needle up, one thread below where you started from. It should be aligned with the bottom of the stitch. 3. 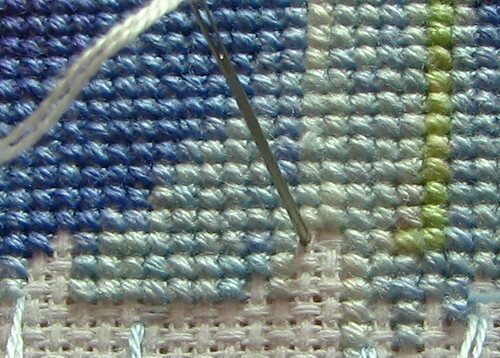 Hold the thread tail out of the way, and insert the needle down in the center of the stitch (the same place where you originally inserted the needle). Pull the thread tight, so that a nearly invisible stitch appears on the center/bottom half of the stitch. 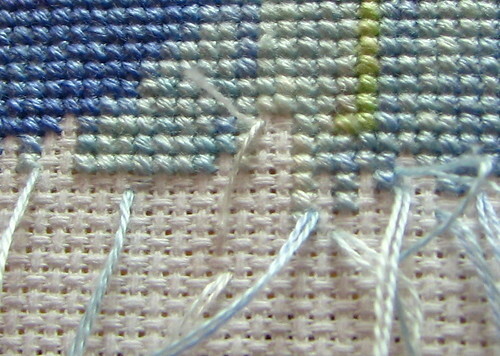 If you are using aida cloth, make sure that this stitch is parallel with the weave direction of the fabric in that square (in this case, the weave is running vertically, so the stitch is vertical; if the weave is horizontal, make a horizontal stitch). 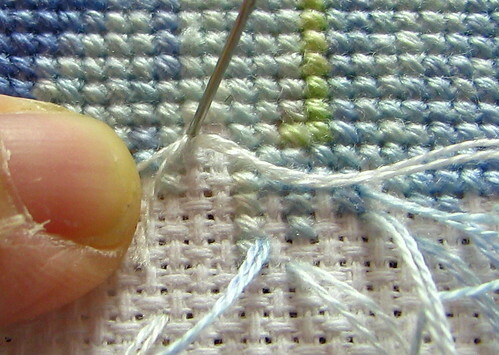 This stitch must be pulled fairly tightly, so that the end does not work itself loose after you cut it. 4. Bring the needle up in the corner to start the first stitch. I like to start my cross-stitches in the lower left corner. 5. Cut the tail close to the pin stitch (sorry, no photo. I was taking these photos myself and needed both hands to cut the thread). The reason for cutting the thread now and not earlier in the process is because by bringing up the needle to begin the stitch, there will be very little tension exerted on the pin stitch, which might cause the end to pop through the fabric to the back. If you cut the thread right after making the pin stitch, a sharp tug can cause the end to pop out. That’s why you should cut the thread when the needle is on the right side of the fabric again. 6. 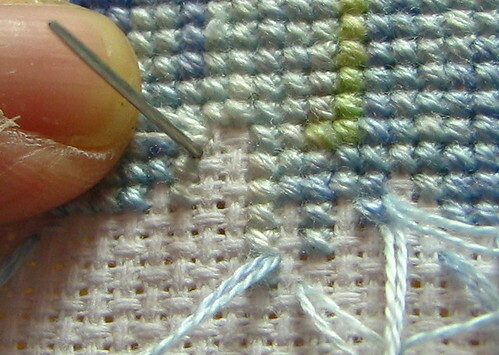 Complete the first half of the cross-stitch by inserting the needle downwards in the upper right corner of the stitch. The entire stitch is worked on the front of the fabric, which makes the back very neat. If you’ve ever tried to unpick this stitch, you will discover that it is quite secure. Because the pin stitch adds so little bulk, it is ideal for designs with lots of “confetti stitches” (isolated stitches, where you have to begin and end a single stitch in one colour). The only important note is to make sure that the stitch is tightened before you cut the end. If you don’t tighten the stitch, the short end may work itself loose. Part 2 will show you how to end a thread with a pin stitch. This entry was posted on August 14, 2009 at 1:03 pm	and is filed under embroidery, needlework, tutorial. Tagged: needlework, pin stitch, tutorial. You can follow any responses to this entry through the RSS 2.0 feed. You can leave a response, or trackback from your own site. Mayté–I hear that name again. It was from her writings that I learned to do this technique in beginning and ending. I think it is called “invisible stitch” by the chinese and japanese embroiderers, who has been using this technique since thousand of years. that is how they can make two-sided embroideries, one could not tell where they started and ended. lol! OMG!!!! I am officially a convert! No more knotting and messy backsides 🙂 thank you for posting this tutorial!! I am so happy. Great tutorial, but you should have had a manicure before taking these close-up pics! I don’t care what your hands look like they are the hands of an angel for sharing this. Mind your manners Kaatje. 🙂 I’m so glad you find this useful! Pleaaaasssseeee… Does it matter ?? She is showing us a great trick, I never looked at her hand !! I found your post while searching for some help with learning to park thread. I immediately tried this method the next time I had to end and begin a thread and I think I’m going to love it! I’ve always hated having the shag carpet look on the back of my piece, plus sometimes the strays will pop through when I pull another stitch through; this will cut that out totally I’m imagining! I shared it with a stitching Facebook group I’m in (https://www.facebook.com/groups/22998725394/); maybe some others will be appreciative of this information too! Glad you found the info helpful! I followed the link and joined the cross-stitch group on FB. I’ve used this info many times and I’ve shared the page with several cross stitch groups on Facebook. Thanks for taking the time to illustrate it for us! Great! I’m glad you found it useful. I love this idea, any suggestions when using perforated paper? I have been using the Mill Hill brand designs and like the paper but especially with the beads it is really hard to keep the stitches secure without having the back look messy. Sorry, I’ve never worked with perforated paper. I can imagine that it would be tricky to keep stitches secure! There must be a forum somewhere with tips for working on performated paper. Good luck! Thank you very much for sharing your knowledge! I had never heard of this technique, and now I’m going to try it. You are very kind to offer this advice, and I can’t believe someone mentioned your fingers! Mine are the same, and I don’t manicure because I’m always cleaning my own house and, well, why have perfect nails? Would rather have a clean home + spend more time gardening and stitching and reading tips! Blessings, and fun with your stitching! Love your tutorial, pics were a big help. How doyou get your stitches to stay so neat. Mine just don’t seem to look neat. They all go in the same direction, a few tension looks loose but the others just don’t seem to stay laying neatly. I am only using one tread and you think it would be simple? Hi, Cathy, Glad you liked the tutorial! About neat stitches–that’s a tough one to answer because there could be a lot of factors. One possibility is a mismatch between the floss and the thread-count of the fabric. You are using one strand, but if your fabric is quite coarse (28 threads per inch or less), there isn’t enough thread to cover the fabric adequately and the result can look “stringy” and messy. Is your fabric stretched in a frame? I use Qsnaps for small pieces and a big scroll frame for large pieces. It’s very hard to work neatly if you’re holding the fabric in your hand. Even a hoop is better than nothing. Is your floss of good quality? If it’s DMC or Anchor, then it’s fine. If it came in a kit of unknown origin (say, a toy store) or if the floss is a no-name brand from China, it might not have a smooth finish or enough fibers to lie neatly. If it’s a good floss but really old, flosses can deteriorate. Sometimes they develop dry-rot (you’ll notice lots of fluff) or get sun-damaged if you leave them in a hot place like an attic or a car for too long. Are you using too long a strand? I use pieces that are 18″ long. If I use longer pieces, they get abraded from constantly being pulled through the fabric and then they can start looking a little thread-bare. If you are sure that your single thread is suitable for the weave of your fabric and that your floss (and fabric) are in good shape and are good quality, the fabric is stretched in a hoop or frame, and you still have trouble getting neat results, I recommend you show your work (bring the materials along) to a more experienced needleworker or maybe a craft get-together. Another possibility is a needlework store, but make sure that you go at a slow time (i.e., not when they’re trying to deal with a lot of customers), ask really nicely, make sure that the clerk doesn’t mind helping you, and bring all your materials. Afterwards it’s a good idea to make a small purchase or two because they do have to make a living and helping someone who isn’t a customer is really above and beyond the call of duty. LOVELY tutorial! WOW just amazing to learn this! Thank you so much!